Welcome to 2019, and in the Chinese new year, it will be the Year of The Pig. Let’s not read into that too much. Anyway, in terms of the Chinese Zodiac, the pig represents wealth and fortune. The pig is a rational, hard worker that occasionally treats itself. It brings energy to anything it does. So, in a counter-intuitive twist, the pig means productive, successful things for 2019. Delaware Contemporary will be hosting their annual China Pop party/exhibition in 2019 on February 9th. 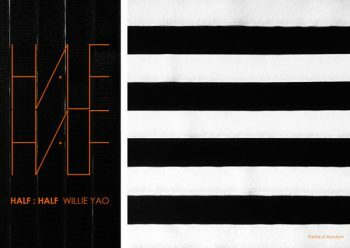 Leading up to that, Delaware Contemporary will be introducing a new solo exhibition by Chinese artist Willie Yao and I’m here for it. HALF:HALF is an exploration of the self by Yao. The first HALF, which focuses on the internal, is comprised of his graffiti style drawings. He compares earlier, most embellished work, with his new, simpler abstract compositions. The second half of this exhibition focuses on collaborations between the artist and other well-known Chinese artists such as photographer, No. 223, and editor of street fashion magazine, YOHO!, KidK. Yao’s work is reminiscent of Keith Haring, Jean Michel Basquiat, and Julian Schnabel. He has previously illustrated for GQ, Bazaar, Modern Weekly, and other publications in China. Stop by and view paintings, mixed media collaborations, and a short documentary on the making of the show, during the First Friday Art Loop in Wilmington this Friday from 5 – 9pm. As an artist and community art enthusiast, I’d like to deviate from my standard Mixed Media fare for a second, and highlight a great opportunity going on at the Delaware College of Art and Design. “No Starving Artists,” is a speaker series that is free to the public and provides insight from financial advice, to networking opportunities for aspiring artists. I’m thrilled that they are providing this to the public, as navigating the world of career art is damn near impossible on your own. “No Starving Artists,” is generously presented by The Money School of the Delaware Financial Literacy Institute. Although I’m a bit late to the game, and the marketing workshop already passed, you can attend the Money Workshop on January 9th and the Management Workshop on February 13th. On February 28th, stop in for the Panel Discussion and Wine & Cheese Networking Event. This portion of the series will include a panel of representatives from local business and arts agencies. “Networking,” an activity that is a notable albatross of many an artist, and often completely absent in their diet, is, in my opinion, extremely important. Rarely is the opportunity to freely mingle with experts provided. You usually have to buy a ticket to some benefit, reception, class, whatever. So, take the freebee! Drop in to Delaware College of Art and Design at 6pm for these events. As part of West Chester’s First Friday, stop by Church Street gallery for the artist talk featuring the spotlight artist, Philip Jamison. Learn more about Jamison’s process as a watercolor artist. Stop in from 7 – 9 for the discussion and mingling. This exhibition runs through January 12th.